Inward cargo: 40 large drums of lubricating oil, 60 large drums of crude oil, 142 sheets of iron plates, 180 bags of coal in straw bags, 400 bags of rice, 700 bags of sugar, 50 kerosene tins of edible oil. 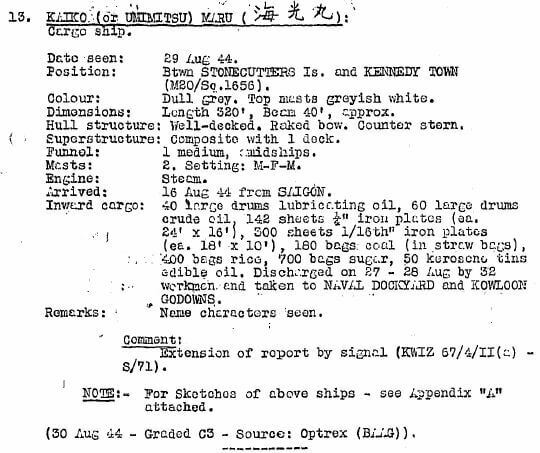 Discharged 27-28 Aug and taken to the Naval Dockyard and Kowloon Godowns. This article was first posted on 24th September 2015. There were several Kaiko Maru’s with the kanji shown above. All of them had engines aft, not amidships and operated in areas elsewhere. The one exception (1921, 233 gross tons) was being used as an auxiliary submarine chaser on the Manila-St Jacques, FIC axis and does not match the description. It seems more likely the ship referred to is 海口丸 Kaiko Maru (1902 built 2698 grt) that was ex Moller’s Mary Moller.. This ship was known to be operating in the Hong Kong area at this time and fit the dimensions closely.